When you go to Scotland, you’re sure to sense something special there: a love of life with the courage to meet life’s hardships with wit and courage and never, never to give up who you truly are. One has to only remember Magnus Eunson, the founder of the Highland Park Whisky Distillery, to see these elements reflected in the Scottish character. After being defeated by deceit in the Battle of Culloden in 1746, Scotland became an occupied country where even its national beverage was prohibitively taxed by the victorious English. It was bad enough that the English had banned the kilt and golf, but in essence whisky, too! That was too much. So the Scots fought back. They brewed and aged their own, choosing to dodge the hated English tax collectors. And this is where we first meet Madnus Eunson. A man of many talents (like so many Scotsmen), he was a butcher, a church official - and a very skilled smuggler, especially when it came to whisky. As a result, the English taxmen or ‘excisemen’ were always on his trail, trying to find his secret hiding places. One of Madnus favorite places to hide whisky was the local church. After all, he reasoned it only made sense that such “good spirits” belonged in a holy place. But after some weeks, the English began to suspect the church basement as a hiding place. Quickly, Madnus and his friends quietly moved the whisky casks into his own home where he covered them with a long white tablecloth. On top he set an empty coffin. Then he invited his neighbors *with the promise to share with them later a good dram” to come and “mourn” loudly, very loudly the empty coffin. When the English broke into the house, they were greeted by loud laments and heart-tearing cries of grief. Though they paused, they were more intent on searching the house than respecting the “dead”. It wasn’t until one “mourner” pointed to the coffin and said “smallpox” that they remembered their manners and left – suddenly in a panic to be ‘polite’. Well, with such a founder, it should be no surprise to anyone that Highland Park has gone on to fame and glory as the world’s greatest whisky. Even Winston Churchill acknowledged that when he visited the Distillery in 1939. 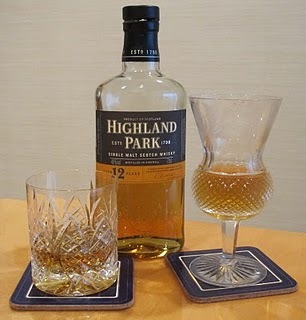 When offered a polite cup of tea (he was English, after all), he declined and asked for Highland Park Whisky with a verbal force that only Churchill could master. But have no fear, you won’t have to smuggle yours or equal Churchill’s verbal torrent. Today you can easily purchase this aged perfection anywhere in the United States or on the Internet. And it’s perfect for the Holidays – as a gift for a friend or just for yourself. Aged in Spanish sherry casks for 12 to 40 years, its single malt flavor melts in mellow tones that say whit and wisdom, courage and tradition, elegance and enduring standards – in short, Scotland! Posted on November 15, 2010 by Ana Kinkaid.